ART CLASH WEEK 1! BATMAN IN A SNOWY GOTHAM CITY — TIED: JAMES AND BRETT!!! › Forums › THE ART CLASH 1.1 › ART CLASH WEEK 1! BATMAN IN A SNOWY GOTHAM CITY — TIED: JAMES AND BRETT!!! This topic contains 20 replies, has 6 voices, and was last updated by Joe Kemp 1 year, 3 months ago. Ok. I think we can safely call this a tie. Congratulations, James! Very nice job. Any thoughts for the subject and concept for the next week? Drop me a line. Otherwise, I’ll have something up tomorrow morning. A couple thoughts on each work, because I really like the idea of lifting up and encouraging artistic growth. So please feel free to review these comments and critiques and then consider focusing on these points over the next week for your new entry. 1) Leslie – I love the style and colors. I really like that you went with your design strengths. I hope to see more of your work here. Maybe consider the juxtaposition and contrast of shape types in your work. 2) James – Amazing piece! I love how you push the background back without the use of ink lines. This is a very solid piece. I think you did a great job on Batman’s general form, but I think the lower half of his body is a little small in places. Check his foremost knee in relation to his elbows. I think increasing the mass of his lower body would really push this piece over the top. 3) Rachael C – You really took this theme and ran with it! Love it! From the style to the color, this reminds me of Dustin Nguyen’s L’il Gotham work. I’d recommend checking his stuff out, if you enjoy this style. Try looking at how he creates form out of simple shapes, in a head for instance. You can break down what he does and can really see his cartooning, or the simplifying of complex shapes into line, at work…and maybe build your own art style at the same time. This is, in my mind, the fastest way to grow as an artist. There’s no need to reinvent the wheel. Build off of what other’s have done! 4) Steel – Love this piece! I really like what you did with the ink and the pencil shading. And that Batman attitude–wow, he’s not one you want to mess with. I think there are two things that will really help you here. First, if you want to continue working with the ink and pencil for shading, you need to develop more tonal variation. Try not to think of the pencil as a third tone (gray), but as a range of gray from dark to light. Also, I want you to work on simple shapes in perspective. We’ll work on that this week, but try to look at some good reference for the types of scenes you want to construct (city skyline scenes, for instance). 5) Me – Inking, inking, inking. I can really weaken the strength of my pencils with poor or weak ink lines. I want to on my ink lines in the coming pieces. 6) Joe Kemp – This is probably anatomically one of the best pieces I’ve seen you do. I really see some of that Michael Turner influence in this piece. The body proportions are really solid. I’d recommend going back to some of the artistic influences that really inspire you and break down how they handle similar poses. Maybe break down some of their work digitally, putting a nearly opaque layer over an image, then on a new layer, break the form down in to simple shapes first. Do your very best to keep from going in to detail here. Then really study that shape and see how these artists use a minimal amount of lines to indicate the general form. Then go in to the detail they use. It’s something I still have to force myself to focus on–a piece can tell the story/identify the shape or object with only the simple, yet concise lines that define the form…but it’s much more difficult to accomplish the same with only the detail and not the lines that determine the form. Additionally, I think we should see more of his left thigh (thought you did a good job separating it from his body with the bolder contour line) and we need more area in his abdomen, even though it is scrunched. So, I think that covers it! Thanks to everyone who joined in. I’m really excited to continue moving ahead. It’s really inspiring to see and chart progress over a period of time. If anyone has any additional thoughts or input, please feel free to post comments and critiques. Steel – amazing detail and I love the attitude and expression – I obviously need to up my game to keep up with your amazing backgrounds and storytelling – I especially love that the bat signal is lit in the background. 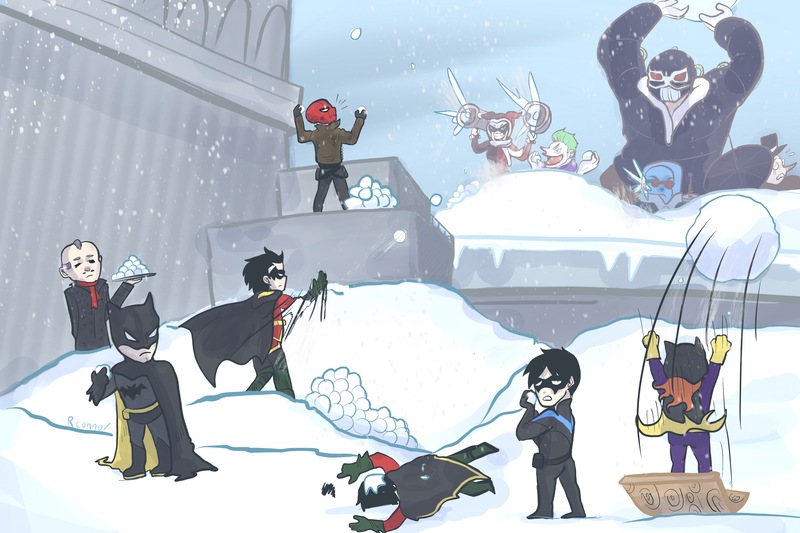 Rachael – Amazingly ambitious piece – the fact that you drew 12 characters is amazing but what is even more amazing is that you really explored the characters personalities – representing them individually in this awesome group shot – i love that you “killed” one of the robins but my favorite part is Alfred being the good butler he is with a silver tray of snowballs. Brett – *got my vote* without a doubt amazing – there is so much good in this piece first off the craftsmanship is on point as usual for you – but it doesn’t stop there – you chose a challenging angle – you drew 4 characters (each with a unique personality) – you drew an incredibly detailed background (once again from a difficult angle) – most impressive you tell a story – this feels like a scene from the animated series where batman, out on patrol on christmas, sees a family walking down the street. The parents oblivious to the situation (possibly due to too much holiday cheer) walk obviously under batman while their curious kid sees a flapping cape in the wind looking up and seeing THE BAT – my favorite part is batman’s reaction is to give a kind (slightly awkward due to his lack of social skill) wave. This might be my favorite drawing of yours that I have seen (outside of that Dumbledore one of course). Thanks so much for taking the time to offer a critique. You have a First Critique badge coming for that! Thanks also for the kind words and for enjoying what I was trying to do in that image. So glad you liked it. If it beat Dumbledore, that’s truly high praise. 🙂 Thanks, man! I want to encourage everyone to offer thoughts, feedback or encouragement on the boards. This is about growing and pushing ourselves. In my wife’s previous workplace, they had this wonderful concept that weaknesses or areas of poor performance were called “Areas of Opportunity.” I loved that. An area where we may be weak today is just an opportunity for explosive growth waiting to happen. But if we aren’t aware, or maybe miss an Area of Opportunity, we’ll miss that chance to grow. So feel free to share! Again, thanks very much for everything, Joe! 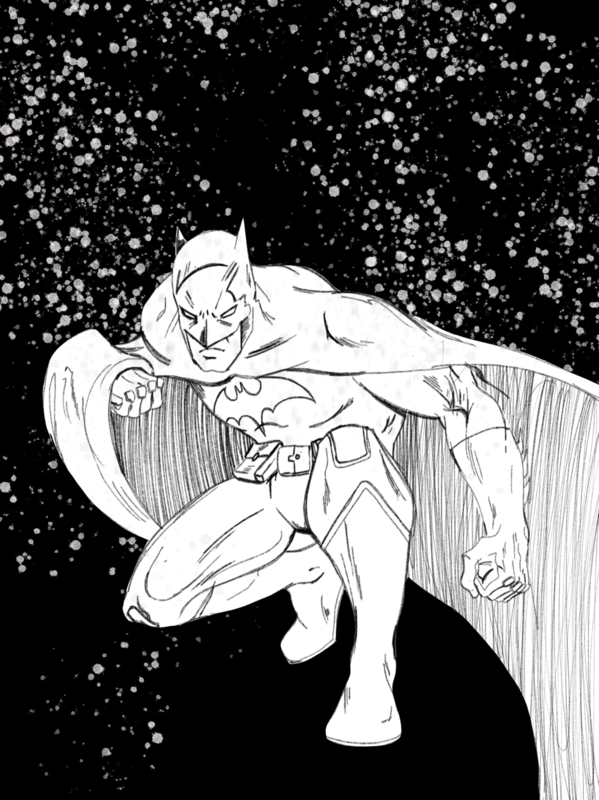 CONCEPT: For those of us who miss the snow, illustrate Batman in a snowy Gotham City setting of your choosing. You may draw from any era, or in any style. THE ART CLASH is a weekly art challenge. Each TUESDAY This MONDAY, JANUARY 1,2018 a new Art Clash challenge will be posted. You may work in ANY MEDIA you like, but you must stick to the brief of this week’s Art Clash. And please, no posting old work in the Art Clash. This is about encouraging growth through work, so we expect a new piece every time. Batman. Snow. First post. How could this year get any better? My Batman in the Snow! I have come to win Joe,James,Brett,Leslie,Knight,Rachael,also,GOOD JOB WITH YOUR ART CLASH GUYS!! !AND THANKS FOR JOINING RACHAEL C!!!! Joe! Great to have you onboard! You’re right on time. I’ll go ahead and open the vote. Good luck to everyone! I was waiting for some thing like that James!! This piece is so amazing Joe,SO AMAZING,one of your best pieces ever!!!! !